After working with kindergartners for several years you know they come to you with all different skills and your job as their teacher is to try and keep them moving along in their progress. Sometimes you have a few kiddos at this point in the year who are still struggling identifying their letters. 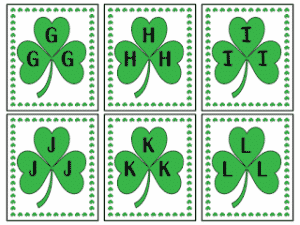 When I pull small groups or have volunteers come in this is something I can have them work on quickly, easily, and just in time for St.Patrick’s Day. I hope you will find it useful in your classroom too!